Is it a crumble? Is it a cake? Does it even have blueberries in it? Yes. Yes. And…yes. The recipe for day 2 is a re-run of a dessert I made for Thanksgiving, posted by TrudyNH on AllRecipes. Unfortunately for TrudyNH (how do you pronounce that? Troo-dee-nuh? Maybe it’s Irish. Troo-dee-eve?) it didn’t turn out quite so well. It tasted great, but the base rose up way too much and engulfed all the toppings. This may have been caused, in part, by cooking an entire Thanksgiving dinner at the same time. It may also have been caused by the recipe calling for a square tin, but who likes square cakes? Ridiculous. But in any case, I like to think it was the fault of the recipe. I completely ignored the recipe for the base, and substituted my own cake recipe – 4oz self raising flour, 4oz sugar, 4oz butter, 2 eggs. Wallop in the electric mixer, scrape it into a greased cake tin. And then, to completely mess with Troodeenaaah’s recipe, I chucked it in the oven at gas mark 4. Why? Because I think the reason it all went wonky last time was due to everything sinking into the base before it had cooked, so by partially cooking the base, I hoped to avoid a repeat of the Great Blueberry Disappointment of 2016. After leaving it in the oven for a few minutes, I removed it, and stuck the blueberries on top, and returned it to the oven. 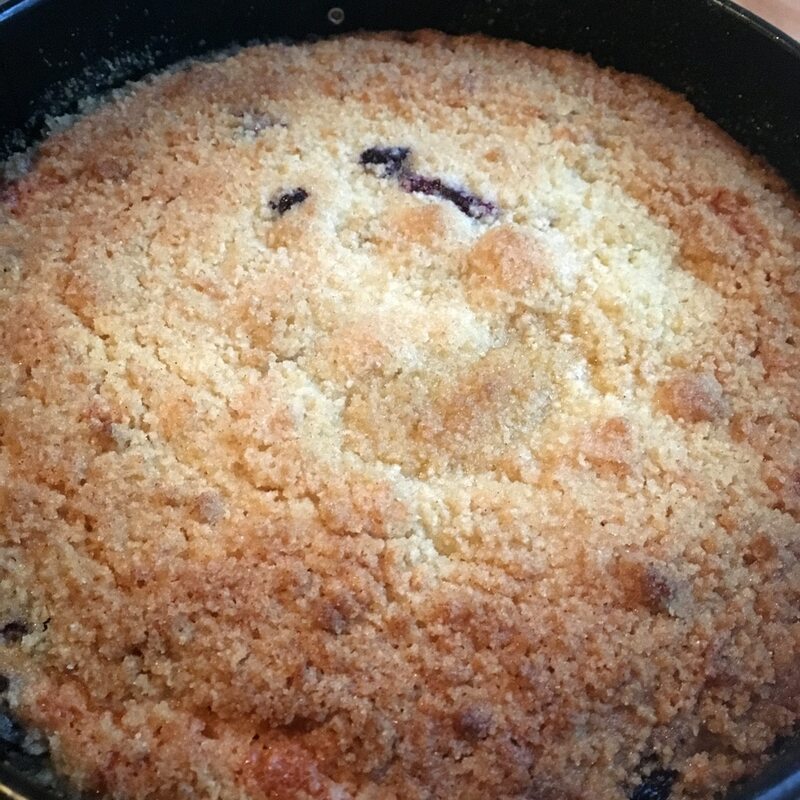 Meanwhile, back at the counter, I mixed together the crumble – but in another deviation from Trurderherder’s recipe, I used self raising flour instead of plain (as recommended by me mother). The recipe calls for half a teaspoon of cinnamon; I replaced this with a metric dollop. Furthermore, I flat out refused to put any work into this, and mixed it with an electric mixer, rather than a fork. Once duly crumbled, the cake was once again removed from the oven, and topped with said crumble. The cake was then promptly shoved back in the oven. After what seemed like several days later, the crumble cake finally made an exit from the oven, and did indeed meet expectations. So, thank you, Troomantripe for your recipe. Even though it didn’t work for me exactly as it was written, it inspired a delicious cakey thing. TL;DR: Managed to fit square cake in round tin. Baked in stages, didn’t collapse. Tastes of fruit. Tried it, loved it. What’s next?